Quick cottage pie! Easy to make with ingredients straight from the cupboard...and still delicious! In a saucepan, put some olive oil. Add the chopped onion, beef mice and chopped garlic. Cook until the onion and garlic are soft and the meat is brown. Add the tomato paste and Marmite and stir into the mix. Cook for 1 minute. 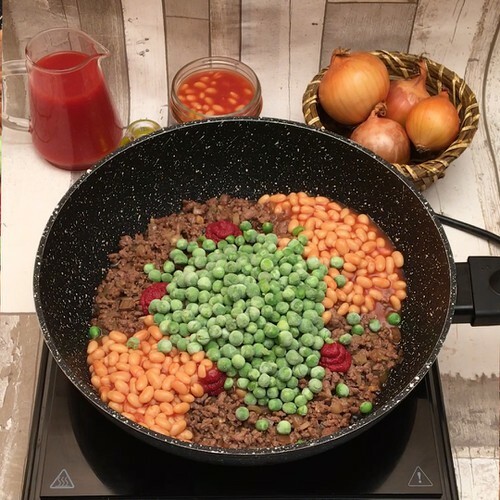 Pour in the can of baked beans and the frozen peas and stir together. Cook until the mix is bubbling hot. Take the saucepan off the heat, and place the mince mix in an oven proof dish. Slice the potatoes into very thin slices, then arrange a layer of potato on top of the mince mix. To make the potato rose, lay a line of overlapping slices of potato and roll them up tightly from one end. Add the rose to the middle of the pie. Grate the cheddar and put it on top of the potato slices. Add a sprinkle of pepper on top of the cheese. Bake in the oven for 15 minutes at 200°C, then enjoy.